Located steps away from Champs Elysées and La Madeleine Place, this Palace Hotel offers a rooftop swimming pool with Eiffel Tower views and an authentic inner French garden. It boasts the award-wining Spa Le Bristol by La Prairie. 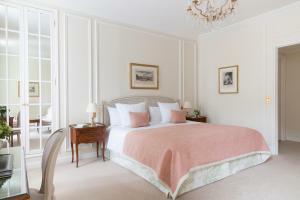 The spacious and elegant rooms are uniquely decorated and some feature Louis XV or Louis XVI style furniture. 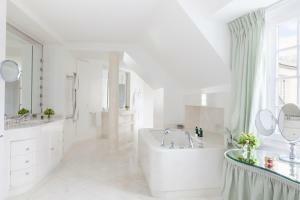 All include a private bathroom with a double washbasin, a bidet and a separate shower. 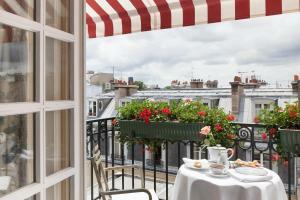 Rooms offer views of the inner garden "à la française", of the hotel's flower-filled courtyard or of rue du Faubourg Saint Honoré. 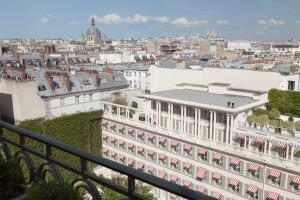 Le Bristol Paris - an Oetker Collection Hotel features a swimming pool with views of Paris rooftops and Montmartre in the background. 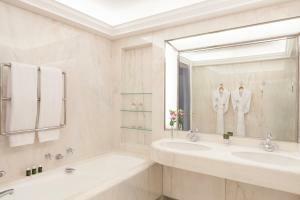 A spa & wellness centre, Le Bristol by La Prairie, including a solarium are also featured. Massages and La Prairie treatments can be provided. 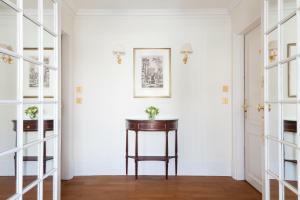 A 1,200 m² private garden and a sun terrace can be found on site. 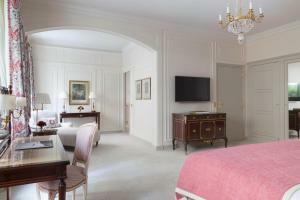 Le Bristol Paris - an Oetker Collection Hotel offers 2 gastronomic restaurants, the 3-Michelin star restaurant "Epicure" and the 1-Michelin star restaurant "114 Faubourg". A kids' club is available on site. 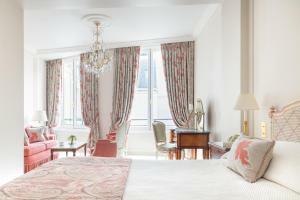 Le Bristol Paris - an Oetker Collection Hotel is located in the prestigious rue du Faubourg Saint Honoré. This area is renown for shopping and art galleries. 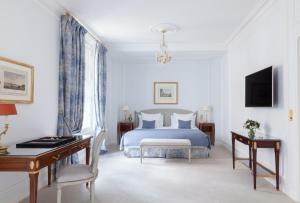 Elysée Palace is 300 metres from Le Bristol Paris - an Oetker Collection Hotel, while Place de la Concorde is 1 km away. Opéra Garnier is 1.1 km away. Paris - Orly Airport is 23 km from Le Bristol Paris - an Oetker Collection Hotel while Charles de Gaulle Airport is 30 km away. A charging station for electric cars is available at the hotel. Please note that Le Bristol Paris can pre-authorise your credit card before the check-in, if the pre-authorisation failed, the booking can be cancelled. Please note that the credit card used to make the reservation and a photo identification will be requested on arrival. The name on the credit card and photo identification must match the guest's name. Guests are required to show a photo identification and credit card upon check-in. Please note that all Special Requests are subject to availability and additional charges may apply. 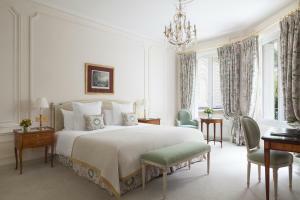 Each room is uniquely decorated and features Louis XV and Louis XVI style furniture.They include a bathroom with a double washbasin, a bidet and a separate shower. 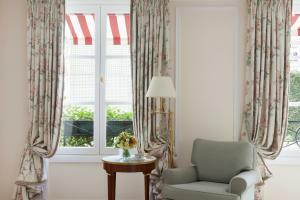 These rooms overlook the French style gardens, the hotel's flower-filled courtyard or rue du Faubourg Saint Honoré. Please note that the maximum capacity of this room is 2. Please note that a baby cot cannot be added in this room. Rate: € 1063.00 ... € 1870.00; select dates below to get current rates. 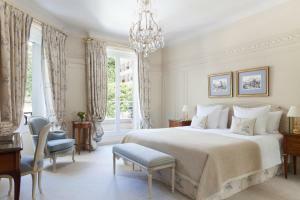 These rooms are decorated with quintessential Paris style and Louis XV or Louis XVI style furniture. Each features a sitting area and a bathroom with a double washbasin, a bidet and a shower. 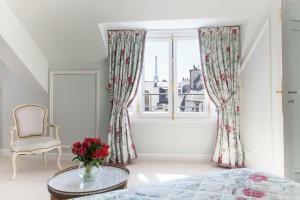 These rooms offer views of the hotel's flower-filled courtyard or rue du Faubourg Saint Honoré. Please note that the maximum capacity of this room is 3. A baby cot can be accommodated in this room. 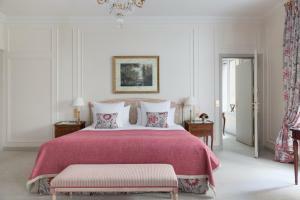 These rooms are decorated with Louis XV or Louis XVI style furniture. 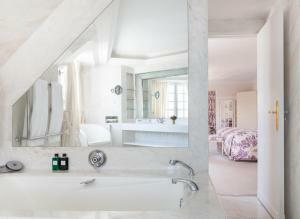 Each room features a bathroom with a double washbasin, a bidet and a shower. 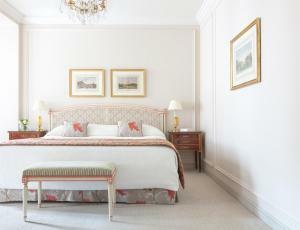 These rooms offer views of the hotel's flower-filled courtyard. Some of them have been adapted to meet the needs of guests with disabilities. Please note that the maximum capacity of this room is 2. Please note that a baby cot cannot be added in this room. Rate: € 825.00 ... € 24270.00; select dates below to get current rates. 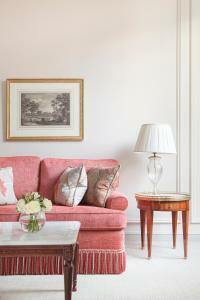 These suites are decorated with Louis XV or Louis XVI style furniture. Each features a bathroom with a double washbasin, a bidet and a shower. 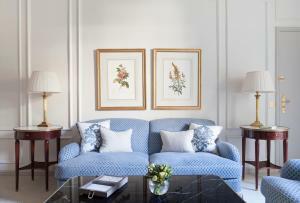 These suites overlook the French style gardens, the hotel's flower-filled courtyard or rue du Faubourg Saint Honoré. Please note that the maximum capacity of this room is 3. A baby cot can be accommodated in this room. 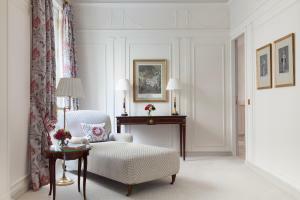 These suites feature paintings from the French masters, sculptures and Louis XV or Louis XVI furniture. 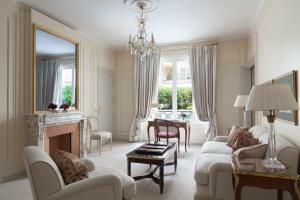 Each one provides a private entrance, a sitting room and a bedroom. 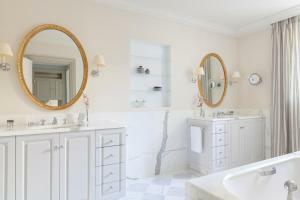 A bathroom with a double washbasin, a bidet and a shower is also featured. 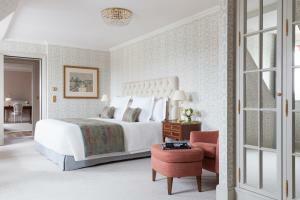 These rooms overlook the French style gardens or the hotel's flower-filled courtyard. Please note that the maximum capacity of this room is 3. A baby cot can be accommodated in this room. 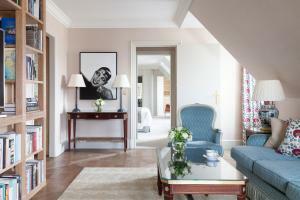 These suites feature antique prints and mirrors as well as 18th Century French furniture. They provide a dressing room and a bathroom with a double washbasin, a bidet and a shower. 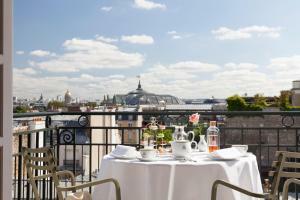 They offer views of the hotel's flower-filled courtyard, the glass dome of the Winter Restaurant or rue du Faubourg Saint Honoré. Please note that the maximum capacity of this room is 3. A baby cot can be accommodated in this room. These suites provide a sitting room, a bedroom with antechamber and 2 bathrooms with a double washbasin, a bidet and a shower. 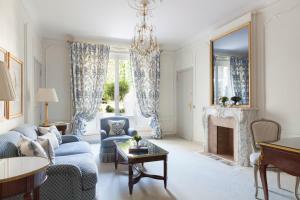 It is fitted with Louis XV style furniture and antique mirrors and prints. 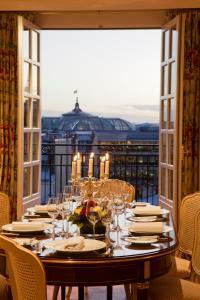 These suites overlook the glass dome of the Winter Restaurant and one offers views of Avenue Matignon. Please note that the maximum capacity of this room is 3. A baby cot can be accommodated in this room. 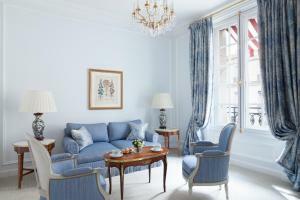 These suites are decorated with Louis XV or Louis XVI furniture. They provide 2 bathrooms with a double washbasin, a bidet and a shower. 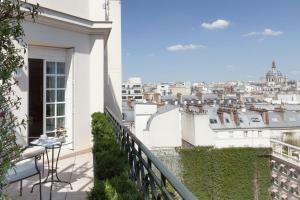 These suites overlook Avenue Matignon, rue du Faubourg Saint Honoré or the Elysée Palace. Please note that the maximum capacity of this room is 3. A baby cot can be accommodated in this room. 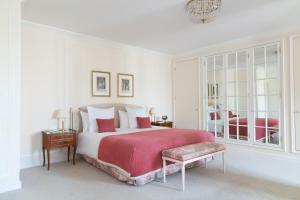 These Deluxe Double Rooms are decorated with Louis XV or Louis XVI furniture. They have a desk and a private bathroom. These rooms have a garden view. A baby cot can be accommodated in this room upon request. 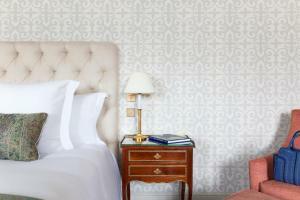 These Junior Suites feature a living area and a private bathroom with a separate shower and a double washbasin. These suites have a garden view. Please note that the maximum capacity of these rooms is 3. A baby cot can be accommodated in this room upon request. Connecting rooms are available upon prior request. 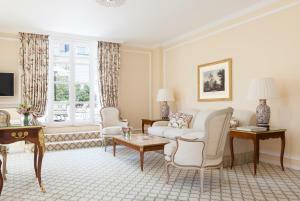 This Prestige Junior Suite features a balcony and a living area. The private bathroom comes with a separate shower and a double washbasin. 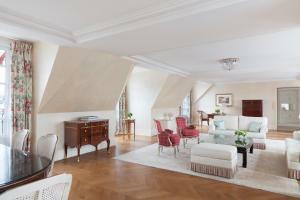 This suite overlooks Rue du Faubourg Saint-Honoré or Paris rooftops. Please note that the maximum capacity of this room is 3. A baby cot can be accommodated in this room upon request. Connecting rooms are available upon prior request. 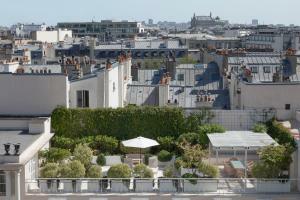 Located on the 5th floor, it features a terrace with a private garden above Paris rooftops. It features a living area and 2 bathrooms, each with a separate shower and a double washbasin. This suite has a garden view. Please note that the maximum capacity of this room is 3. A baby cot can be accommodated in this room upon request. 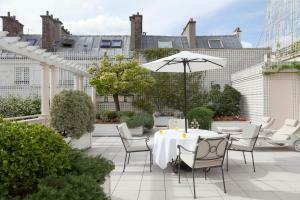 Located on the 6th floor, it features a terrace with a private garden above Paris rooftops and a hot tub. It features a living area and 2 bathrooms, each with a separate shower and a double washbasin. This suite has a garden view. Please note that the maximum capacity of this room is 3. A baby cot can be accommodated in this room upon request. This Penthouse Suite features a terrace and a fireplace. It has a seating area and a dining area. The private bathroom comes with a double washbasin, a separate shower and steam room. Guests can also enjoy a private kitchen. 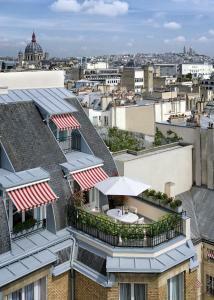 This suite overlooks the hotel garden, Sacré Coeur, Saint-Augustin Church or Paris rooftops. Please note that the maximum capacity of this room is 3. A baby cot can be accommodated in this room upon request. 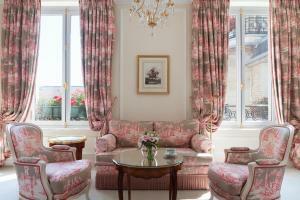 This Suite is decorated with Louis XV furniture and features a terrace. It has a seating area and a dining area. The private bathroom comes with a double washbasin, a separate shower and steam room. Guests can also enjoy a private kitchen. 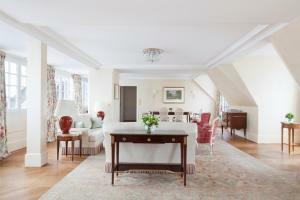 This suite overlooks the hotel garden, Montmartre or Opéra Garnier. Please note that the maximum capacity of this room is 3. A baby cot can be accommodated in this room upon request. 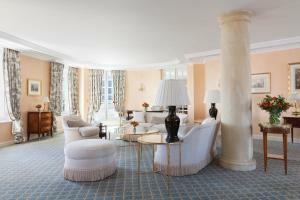 Located on the 6th floor, this suite is decorated with Louis XV or Louis XVI furniture and features a balcony. It has a seating area and a dining area. The private bathroom comes with a double washbasin, a separate shower and steam room. Guests can also enjoy a private kitchen. 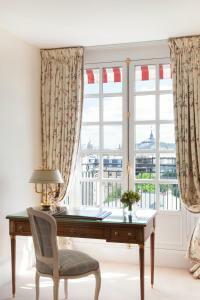 This suite overlooks the Eiffel Tower, Avenue Matignon or Rue du Faubourg Saint-Honoré. Please note that the maximum capacity of this room is 3. A baby cot can be accommodated in this room upon request. 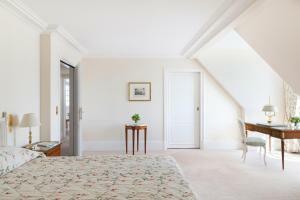 Located on the top floor, this suite features 2 dressing rooms, a dining area and a seating area. 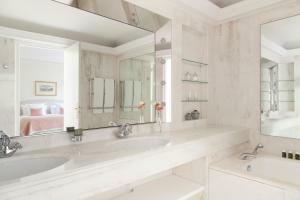 The private bathroom comes with a double washbasin, a separate shower and steam room. This honeymoon suite has a balcony and views over the hotel garden and hotel courtyard. Guests can also enjoy a private kitchen. Please note that the maximum capacity of this room is 3. A baby cot can be accommodated in this room upon request. 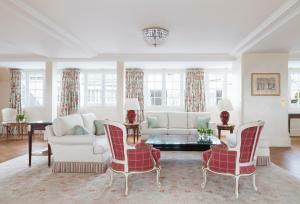 This larger suite features 2 dressings rooms, a seating area and a dining area. The private bathroom comes with a double washbasin, a separate shower and steam room. 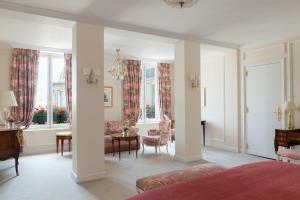 This Imperial suite has views over the hotel garden and hotel courtyard. Guests can also enjoy a private kitchen. Please note that the maximum capacity of this room is 3. A baby cot can be accommodated in this room upon request. 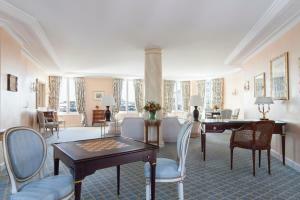 Located on the 7th floor, this suite features a Nespresso coffee machine and a living room. The private bathroom comes with a double washbasin, a separate shower and steam room. 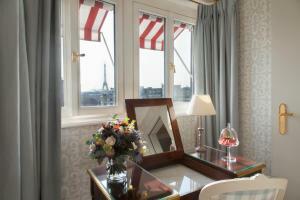 This suite overlooks the Eiffel Tower and Paris rooftops. Please note that the maximum capacity of this room is 3. A baby cot can be accommodated in this room upon request.